If you both live in the Griffin area and operate a business here, this message is especially for you. 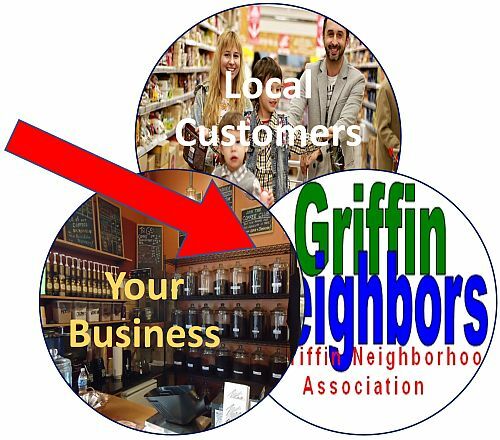 We’re the Griffin Neighborhood Association, and we want to help get you where you want to be. We are your neighbors. We drive the same roads. Our kids may play on your kids’ sports teams. Some of us operate local businesses here, too. We are your best potential customers, and we want your local business to succeed. The Association can help you promote your business in several ways, usually by leveraging some of the steps you are already taking. Our web site, GriffinNeighbors, has since 2003 provided information to our community. Not just about the activities of the Association, but information of general interest to property owners and residents. Our web site can help your business succeed. We have begun to assemble an online directory of local businesses. And we hope soon to be able to roll out new ways to view the directory. You can add a text listing for your business, at no charge. For a display advertisement, there is a one-time charge of $10. By purchasing a display advertisement, you also have access to the display slider, on our web site’s home page. Dogwoods Canine Play and Stay in the display slider. In the left corner of our home page, right under the masthead, is our display slider. A rotating series of images is shown. Click on your image, and an embedded link takes your potential customer directly to a web page of your choosing. The display slider is available for businesses purchasing display advertising in the Local Business Directory. You provide us with an image of 790 x 350 pixels in size, or we can help you to create one. Tell us where you want the embedded link to point, and we’ll run it in our display slider. Our blog begins in the right column of our website, under the heading “News & Opinion” There are displayed the most recent articles we’ve posted. But we’ve been blogging here since 2006. The entire history is fully-searchable and our search engine optimization means an article here is picked up by all the major search engines. Our blog provides you with a great means of getting your story out. Our neighbors want to hear about your business, your passion, about how you came to set up shop here. We can help you write an article that will meet your objectives. Are you an expert in your field? Maybe you have some information of ongoing interest to local residents. Have you ever thought about writing an online series? We can help scratch that itch. When your article is published, we’ll link to it on our Facebook Page and Twitter feed. We want to help local businesses get hooked into the social media already used by residents here in the Griffin area. 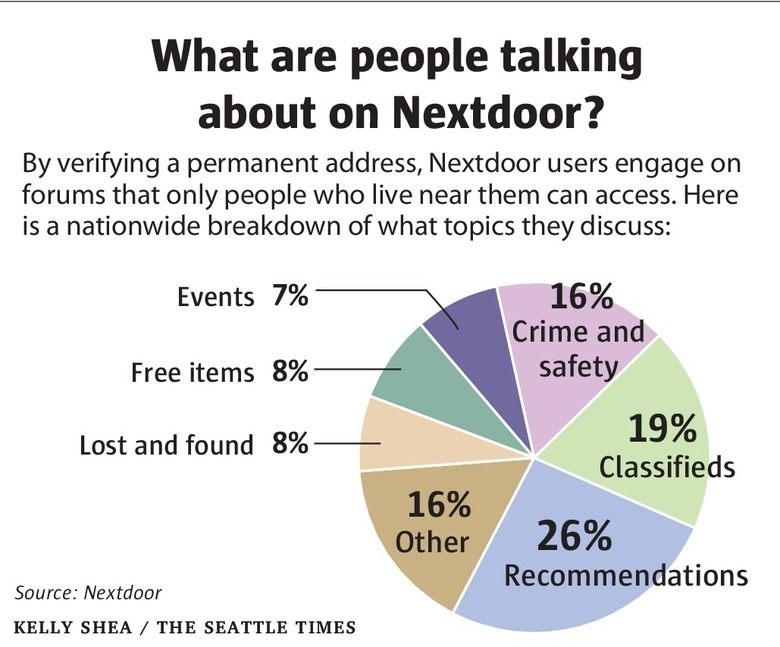 As of mid-2018, nearly 45% of all households in the Griffin area are on Nextdoor. And that number continues to grow. If you are already a member, you are halfway there. Now it’s time to put your business on Nextdoor. That way, when members recommend you, you can be sure the recommendation is tagged to your business. The great review you received will be linked to the important information your next customer needs to act on that recommendation and contact you. Nextdoor will provide you with the tools to see your recommendations and a means of building a profile of your business that members can find when they search for your business or the service you provide. 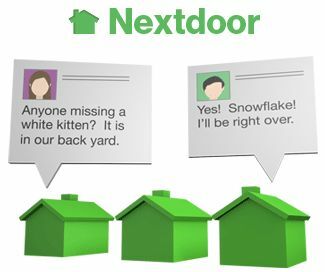 Nextdoor’s tools will help you to manage your reputation, on Nextdoor, and to ensure that every recommendation received is counted and appears on Nextdoor’s “Recommendations” page. If you have not yet set up a business account on Nextdoor, this is a useful first step. We can help you choose between creating an account that’s associated with your personal account or creating a separate account for your business and we can help you to use Nextdoor to build your local customer base. Your neighbors are already sharing their recommendations. Maybe about your business. If your business already has a Facebook Page, this next step is a no-brainer: Send us an email giving us the name of your Facebook Page. We’ll ‘Like’ it, from our page. When you post, we’ll share. Simple. Sure, we want you to ‘Like’ our page, too. But that’s not necessary. Just tell us you’re out there. If you’re a local business with a Facebook Page, we want to know. On Facebook, we’re GriffinNeighbors; who are you? Are you on Twitter? So are we! If you tell us who you are, we’ll add you to our list of local tweeters, we’ll follow you, and we’ll retweet what you tweet. We’re @GriffinNeighbor; who are you? Sooner or later, your business will be on Google. Either you will put it there, or someone else will. We want you to be in control of how your business appears, on Google, and we think you do, too. If your business has a brick-and-mortar location – a retail store or an office you expect your customers to find – we also want you to be on Google Maps, with accurate and informative details about your business. If you’ve hired someone to help you with your social media, have them contact us if we can answer any questions. The Steamboat Island Register is a local periodical produced by Amanda Waggoner who has written, “The inspiration of for this paper is getting more business to local businesses.” Copies of the Register are distributed from locations such as the Island Market, Steamboat Coffee Shop, and Our Community Credit Union. For more information contact Amanda Waggoner at steamboatreg@gmail.com or (360) 870-2126. The Steamboat Island Register is not a project of the Griffin Neighborhood Association. The Griffin Neighborhood Association sponsors community events, and these often provide local businesses with an opportunity to meet potential customers and feature products and services. Join our Local Business Directory and we’ll contact you when we’re planning an event we think would be of interest to you. And, if you have some ideas about how your business can help or participate in an event, we want to hear from you. At last, here’s the sales pitch. And it’s a really soft pitch. 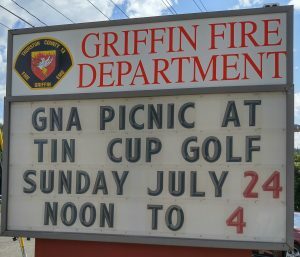 We’re your Griffin Neighborhood Association. We’ve been here since 1990. We think, if you learn about our mission and our history, you’ll want to join us. We’re an all-volunteer organization made up of people just like you. When we work together, we can continue to make things better for all of us, here in our little corner of northwest Thurston County. Click here to learn more about the Steamboat Neighborhood logo you see on the backs of cars and trucks. Boats, too. The Griffin Neighborhood Association, its Board and membership, will assume no liability for the accuracy or validity of information provided online regarding local businesses. We have no responsibility for any work performed, product or service provided, or any actions taken, by a business we name online or its owners, employees, or agents.